Don't Forget April Open House is this Weekend! 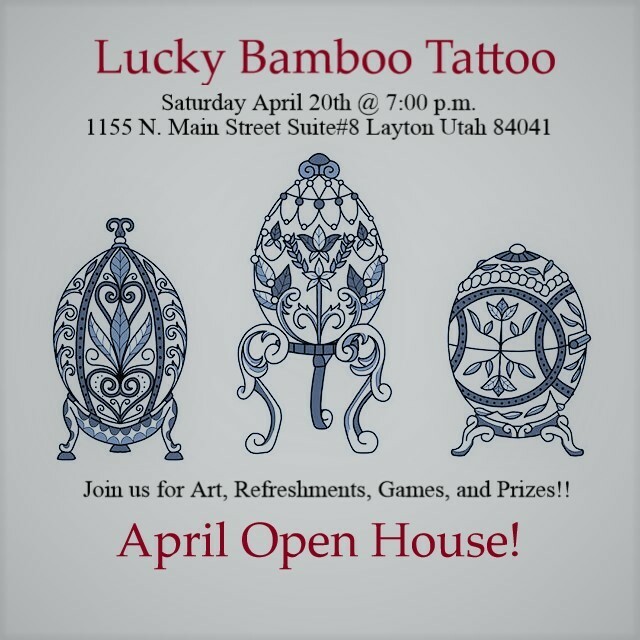 Join the Lucky Bamboo Tattoo Team as we display the latest art from our artist's, have refreshments, and open our doors to the public. 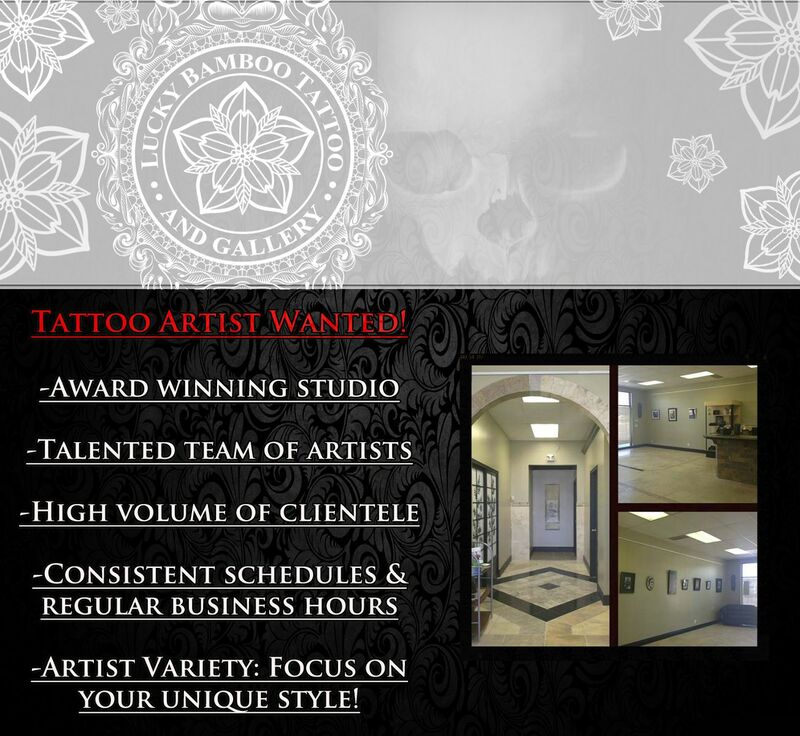 We invite you to come see why Lucky Bamboo Tattoo is so unique! Contact the studio for any questions. We will be having a raffle, tickets can be purchased for $5 either in house or by clickiing here. Now Hiring - Resident Artist! Lucky Bamboo Tattoo is unlike any other studio. Here you can come to work, tattoo all day, and go home. We handle schedules, desposit, and promotion of our artists so you don't have to stress! Finally got my first tattoo by Pineapple! He's SO talented. I love the shop & was very impressed, I'm definitely coming back! Love my tattoo in honor of my mom who died when I was a young child. Thanks for everything Pineapple ! "I love the atmosphere here. Everybody is very professional and did such a wonderful job! This is the only place my friends and I go." Pineapple is one helluva artist; his work is outstanding! Add to that the awesome staff, facility, and atmosphere....it was a great experience! Okay first of all, Lucky Bamboo is #1. Every interaction I have had with the receptionists have been great. They listened to everything I wanted and responded quickly to all my questions. Second of all, Pineapple is LEGIT! He did my very first tattoo and I'm telling you, he did the best job! I came back for my other tattoo. I would recommend them 10/10! Thanks for being awesome guys! "UPDATE. Got my tattoo. Love it. Pineapple took my idea and my margin reference material and created a fantastic tattoo. During the sit down consults he listened to my ideas a fleshed out what I wanted. During the tattooing he kept checking in on me to make sure I was doing well. Aftercare was thoroughly explained and simple. Pineapple was prompt to respond to my email regarding aftercare. Short answer; Pineapple delivered a significantly better tattoo then I could have ever imagined. My visit was unscheduled. I am looking to get a tattoo and stopped by for a consult. Pineapple was already occupied tattooing another gentleman but with Casey's help answered all of my questions. Casey then gave me an impromptu shop tour. Very clean store. Casey was very patient with me and answered, what I am sure are very basic and rudimentary questions she has answered a thousand times, without any condescension or annoyance. Thank you." Had a great experience. This is my second time there and would recommend it to anyone wanting a tattoo. Especially if it is their first. Lucky Bamboo is a nice, clean shop with a good vibe. Staff and environment make you feel comfortable and I was able to walk in and get what I wanted. I wanted it touched up a littlbe bit later and Jared took me right back and fixed it no questions asked. Would definitely go here again and recommend to anyone looking for a great shop! I love love love this tattoo parlor! Everyone was kind and friendly. Christina was amazing and I will be back for sure! Thanks for making my experience such a great one. I had a wonderful experience with this studio and Haylo. There were a few "bumps" but they were addressed and taken care of promptly. I am an artist myself and Haylo was the first tattoo artist that was confident enough in her own abilities to replicate my art. I had consultations with other shops and artists and all they wanted to do was make changes, which told me that they either weren't confident enough or able to replicate my style. I am also a super picky person, especially when it involved something permanent on my body. I was impressed that each artist had their own sterilized room to work in and I was put at ease that Haylo was on the ball with sanitation procedures. I also have an auto immune disorder that impedes my ability handle stress, heal quickly and properly, she made sure that I had the green light "go" from my doctor that I was alright to get the piece done and I made sure to follow ALL her directions for aftercare and experienced NO issues and the piece healed perfectly. Haylo was always considerate with how comfortable I was and treated me almost like a princess during my sessions and made sure that I was happy. The piece has a lot of meaning behind it and she did it justice, when she finished it today I was almost ready to tear up. I am definitely referring her to others and she is well WORTH the asking price for her time. Jared seriously needs to give her praise and keep her around for a long time to come and she really is a joy and talented Tattoo artist. Thank you, I'll be in touch with Haylo to continue an addition to this piece. Christina tattooed a large 3/4 floral sleeve on me and I am so happy with it. The shop is very clean and comfortable with private rooms and they make sure you are as comfortable as possible. Christina is an amazing artist and I loved working with her. Would absolutely recommend this shop. Great place! Pineapple is awesome! I wouldn't go any place else. I highly recommend both Lucky Bamboo and Pineapple as the artist. This is my fourth visit to Lucky Bamboo Tattoo. I already can't wait for my next visit. 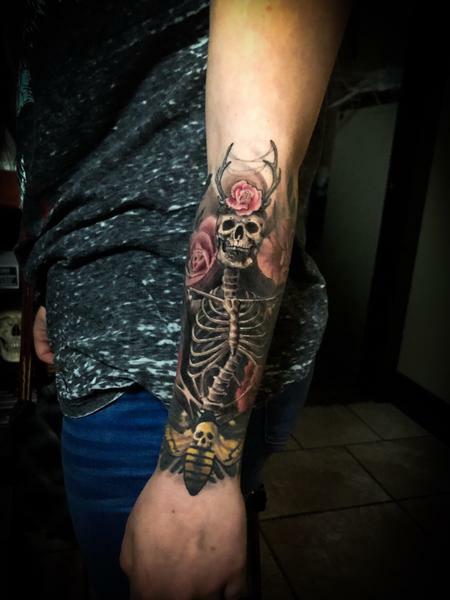 "Got my tattoo done by Christina a couple years ago, she is very talented with her watercolor look! Still love it and thinking about coming back for another one soon!!" Christina tattooed a large 3/4 floral sleeve on me and I am so happy with it. The shop is very clean and comfortable with private rooms and they make sure you are as comfortable as possible. Christina is an amazing artist and I loved working with her. Would absolutely reccomend this shop.